Kids will enjoy sections that include: What's that Word? fill in the blanks; Who Said It? famous Bibel quotes; A Man After God's Own heart - David; God's Promises - New Testament Assurances; and Days of Creation - Genesis. Each section is designed to applaud a child's current knowledge and foster long lasting excitement for Bible reading and understanding. Also includes illustrations, jokes, and riddles. Ages 8 - 12. There's a new addition to the successful Take Me Through the Bible series! The authors of the popular Memory Verse Games for Kids offer another fantastic way to get children involved with God's Word. Children, parents, and Sunday school teachers will be delighted with this amazing collection of fun-filled games designed to encourage and challenge kids to discover what the Bible's all about. Each section is designed to applaud a child's current knowledge and foster long-lasting excitement for Bible reading and understanding. 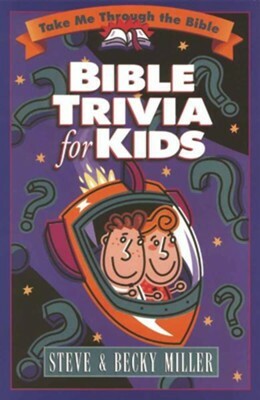 Along with terrific games, Bible Trivia for Kids includes illustrations, jokes, and riddles. Perfect for ages 8-12 (3rd-7th grades). Steve Miller, coauthor of The Best-Ever Christian Baby Name Book, has also written One-Minute Promises, One-Minute Praises, and One-Minute Promises of Comfort. Along with his wife, Becky, he coauthored the popular illustrated book A Child's Garden of Prayer. The Millers reside in Oregon's Willamette Valley and have three sons. Steve and Becky Miller created the popular Take Me Through the Bible series, which includes Word Searches for Kids, Memory Verse Games for Kids, and Amazing Mazes for Kids. They reside in Oregon's Willamette Valley with their three sons. I'm the author/artist and I want to review Bible Trivia for Kids.